Pyramid power - since the beginning of time, humans were using pyramid shaped objects for luck, for energy, for vibration, for healing, etc. 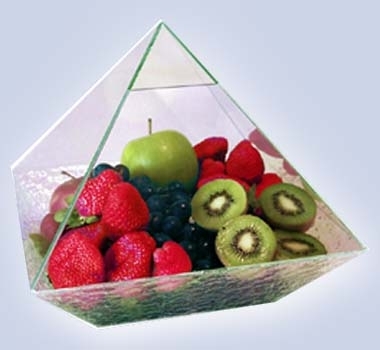 Pyramids generate negative ions, therefore they are believed to be very beneficial for health and well being; they have balancing effect on the electromagnetic field of the body. They are excellent to be placed near plants. Some say they charge crystals for healing or scrying. Many books have been written on this subject, and internet is full of data on the subject. 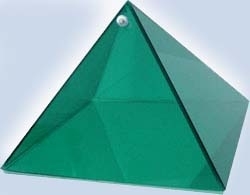 Pyramid can be used as a container. One wall can be opened. 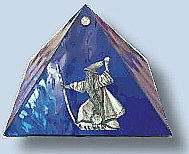 You may put a rasor blade in a pyramid - it will be sharpened within 24 hours. place your wish inside; Wait for 7 days - minimum (depending on the wish; some wishes may take up to three years - do not remove the written wish until is fulfilled). Sincere wish comes true, if it does not, may be... it is not the best wish for your well being.